Madge returns from the prison to announce that Henry has lost his parole. At Des' party Clive announces that the Daphne is pregnant. Paul, Scott, Lucy, Jim and Helen are sitting at the kitchen table eating dinner, Lucy comments that she full and everyone agrees with her. They laugh about them not eating everything and Paul jokes that what they didn't eat Eileen wrapped up in plastic to take to the coffee shop, he has heard of thrifty but that is cheap. Jim still laughing says that she probably thought she was helping out. Scott then goes into fits of giggles; Lucy wants to know what is so funny. He tells them that he was just thinking about Nicky on that long flight to America they will be feeding her all types of stuff like… food….and food….and food! They all burst out laughing. Helen says that they have only got themselves to blame for over eating. They discuss what a great party it was and how excited Daphne and Des were over the pregnancy. Lucy pipes up that Susan was happy as well with the engagement and she wonders when the wedding will be. Paul snaps bitterly “That will be her problem won't it!” Paul makes his excuses to leave for his flight to Adelaide; he hopes to be back the next afternoon. Scott asks if he and Lucy could be excused from the table as Lucy wants to see the stuff he has done on Grandma Robinson, and they rush off to look at it. Helen looks quite despondent and says “Well it is just us” Jim replies that she looks like she could do with the break. 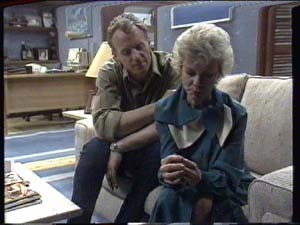 As Helen stares into space and looks very unhappy, Jim tells her that it is possible that if she talked about it, it might help when she doesn't answer he prompts her and continues “the phone call this afternoon” Helen comes out of her trance and looks at him earnestly and tells him that he doesn't need this- he has enough problems of his own and this is such a terrible…terrible….terrible mess. Clive and Susan are going through a checklist of things she needs to take with her to Adelaide…as Paul arrives (walking straight in without knocking or a key….!) and asks if Susan is ready. Susan says she is but she just wants to say good-bye to Sam. As she goes to see Sam Clive tells Paul that is a beautiful suit you are wearing. Paul sneers back that he shouldn't get smart. Susan says her good-bye's to Sam and is about to walk out when Clive coughs loudly. 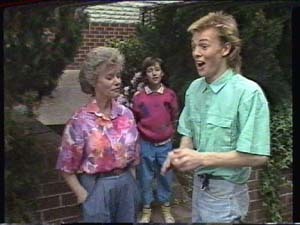 Susan stops and gives him a passionate kiss in front of Paul much to his annoyance. Paul makes a sarcastic comment that they can save that for the back row of the movies; they have a plane to catch. Susan stops at the front door and says that she hates to leave. Clive tells her that it the fullness of time she could be looking at one of the great child doctors …Doctor Clive Benjamin Spock Gibbons…benefactor of bouncing babies….trust me. Susan kisses him on the nose and leaves with Paul. Jane joins Charlene in the street and asks her if she is feeling confident. Charlene replies that she is feeling the very opposite, she is petrified. Jane jokes just think how we will feel in three hours time…one more exam and then no more school. Charlene says that she crammed all night and that she has circles under her circles and indicates the lines on her face. Jane thinks that they should celebrate somehow, and wants to know what they could do. Charlene doesn't know but that she intends to jump twenty feet into the air and then rush home and throw her notes into the incinerator and burn them. She tells Jane six years up in smoke she can't think of a better way to end her school career. Jane is shocked and thinks Charlene is kidding but Charlene continues why doesn't Jane bring her notes too they could have a real bonfire. Jane laughs and says that her Nan somehow wouldn't approve and that she would probably call it a pagan ritual and call the fire brigade. Helen and Jim are preparing breakfast as Scott and Lucy come in squabbling over a “scary” movie. Jim tells Lucy it is her own fault for watching a movie before she went to bed. Lucy sticks her tongue out at Scott who comments that it is a very witty comeback. Lucy just thinks he is grumpy because of Charlene. Helen tells the pair of them that if they don't stop bickering then she will get grumpy. Scott tells them that nothing is going to make him feel worse than he already does. Jim thinks he should wait for the results of his exams he might be pleasantly surprised. Helen says to Jim that now might be a good idea. Jim starts to talk to Scott about driving lesions, but before Jim can explain anything Scott jumps in and says “You guys really know how to make me feel lousy don't you” Jim tells Scott that if he would let him finish that Helen and himself would like to help him out with driving lessons seeing that they are going to get him a second-hand car. Scott is thrilled until Jim says that they can start the lessons in a week or so's time. Scott is rather depressed at this and feels that seeing that he has to get his “P's” first and this will be just before the exam results which he is also going to fail. It is unlikely that he will get the car. Lucy pipes up “See what I have to put up with the guy's a manic depressive” Helen wants to know where Lucy gets these expressions from and tells Lucy to give Basil some fresh water. Lucy goes off to do as she is told. Scott also leaves in a huff. 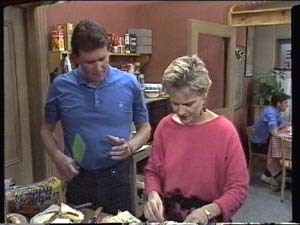 In the coffee shop kitchen, Daphne is cooking as Des swats flies (so very hygienic…a health inspectors nightmare!) Des swats a fly and manages to hit Daphne slightly on the head. Daphne yells at him to be careful. Des tells her “No worries” and asks if there is anything he can help with they are a partnership now, then in baby talk pats Daphne's tummy and says “Isn't that right junior!” Daphne is pleased that he has taken two weeks off from work. 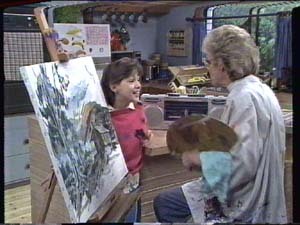 Des tells her that the first thing he is going to do is to paint the spare room. Turn it into a nursery or maybe wallpaper it ...Darth Vader or Star Wars! Charlene, Jane and Mike come bouncing into the coffee shop on a natural high after completing their exams (which seem to have gone on forever!) Mike says that the drinks are on him. Jane shyly declines his offer and says that she will get her own. Daphne wants to know what the big plan is now, have they got some sort of party organised. Charlene tells her that they were just going to grab some food and go back to her house. She beams and continues that it feels so good that the exams are over. Des asks Mike if he is all right to work this afternoon but Daphne tells him not to be so ridiculous that she can manage and Mike needs to let his exam tension somehow. Charlene still beaming agrees with Daphne and tells her that they are going to P-A-R-T-Y! Clive is roaming around the living room trying to decide where to put two vases of flowers…keeps moving them from the living room to the kitchen and back again. He is tiding up as Susan arrives back from her trip to Adelaide; he immediately wants to know how it all went. Susan tells him that the conference only took a couple of hours. Clive then wants to now how Paul was. Susan assures him that she thinks that he has now got the message. Clive says that he is sorry for being inquisitive but they are engaged and speaking of which how does tomorrow sound? Susan thinks that it is a bit short notice and they have only been engaged for two days. Clive jokes that it seems like a life time to him. Susan seems reluctant and says there is a lot to think about and that it is a big step. Clive says that it is a step that usually follows unless she has changed her mind. Susan assures him that she hasn't. Clive replies how about next week. Susan laughs and suggests six weeks. Clive says is that your final offer when Susan nods Clive continues good, I am glad we got that sorted out, now when do we go shopping for a ring. Susan is reluctant to have a big flashy ring and suggests that Clive put the money towards the house instead. Clive replies that he wants her to have one so that everyone in the Erinsborough knows it is official and he wants to prove how much he feels for her. Susan is still reluctant and replies that she is an unmarried mum and people which think it is a bit tasteless if she is flashing around a diamond, she would rather wait for a nice gold band. Helen is painting in the kitchen when Lucy rushes in all excited about Scott having just arrived home via the back door. Lucy is jumping up and down saying she can't wait to see his face. Helen tries to get her to calm down so not to spoil the surprise. A very grumpy and despondent Scott comes into the kitchen, Helen tells him that Jim has come home with some “shopping” and he could do with a hand in getting it in. Scott is irritated and asks if Lucy can do it! Lucy grabs his hand and pulls and pushes him out of the front door and down the front garden much to Scott's annoyance. On reaching the driveway Jim is there sitting on a car. Scott's face lights up and he asks if he is joking. Jim tells him that no matter what happens in his exam that he has worked very hard and that is the main thing. Helen tells him that they are very proud of him. Scott beams thanks Jim and gives him a big hug. Lucy is still very excited and asks if they can go for a ride in it. Helen holds her back. Scott looks around the car and jumps in and tells Jim that he won't be sorry that is a promise. Mike catches up to Scott and explains that there was nothing going on between Charlene and him. Scott admits that it just upset him seeing them together. Mike thinks that this is probably because that he still has feelings for Charlene. Scott agrees that it probably is but that he has blown it because of all the stuff he said before the exams. Charlene wanted to make up she wanted them to be friends but all he did was give her a hard time. Mike says that Charlene would love to give it a go but Scott insists that it wouldn't work out. As they start walking down the street towards the Robinson house; Mike says that it looks like we are both losers in love. Scott continues that it might be just as well, as when the exam results come out he isn't going to have much of a future. He feels that Charlene would be better of without him. 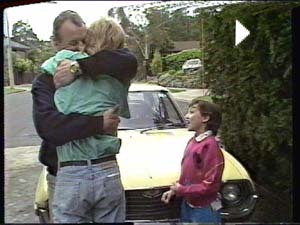 Mike tries to reassure him and says that he will get a good mark then his dad will be able to buy him that car. As they arrive at the Robinson driveway, Scott beams and tells Mike that Jim changed his mind and he has the car already. Mike rushes around the car excitedly and says what a top bloke Jim is. Paul comes out of the house and comments on the new “Scott mobile” Scott waves the keys at Paul and asks if they can take it for a test run, Paul agrees and suggests that they take it to an open space where he can put on his “L” plates and go for it himself. Scott readily agrees and jumps into the car. Mike wants to go but says that Daphne has already let him off a couple of hours today anyway. Scott excitedly says that it will just be a short burn and Mike jumps into the back car. 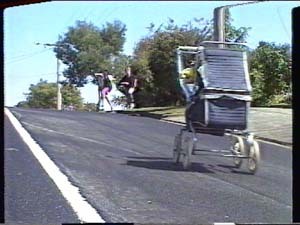 Clive is struggling up a hill pushing Baby Sam in his pushchair complaining that either he has put on weight or he is out of shape. Clive is chatting away to him about possible honeymoon destinations…Disneyland or Lunar park. Clive meets up with Susan at the top of the hill and they bend down to talk to Sam, Clive tells Susan that Sam has decided on Lunar Park for the honeymoon. 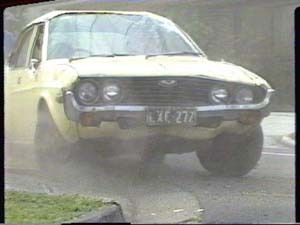 In the meantime a very jovial bunch (Paul, Mike and Scott) are off on their joy ride around Erinsborough, all larking about. Scott's seatbelt appears to be rather loose! Back with Clive and Susan, Clive puts the brake of the pushchair on and asks Susan to close her eyes; he then slips an engagement ring on her finger. Unbeknown to them the brake of the pushchair isn't of firmly enough and the pushchair and baby Sam goes rolling down the hill. Susan screams and both they run after the pushchair. Just as the boys in Scott's new car comes along, Paul swerves the car to avoid the pushchair but the car rolls over several times before righting itself and skidding to a halt…….